Streets are flooded, urban transport works intermittently. The south of Ukraine is hit heavy rain, causing traffic jams and problems with electricity supply in Odessa, Kherson and Mykolaiv regions. 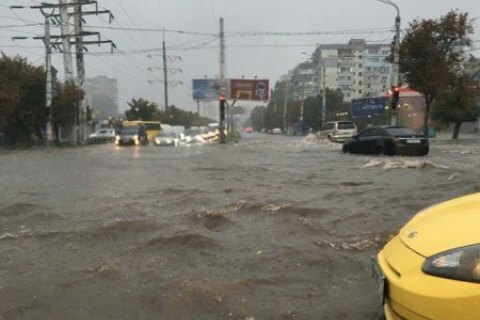 According to the Dumskaya, heavy rains flooded city streets in Odessa. The urban transport is intermittent. Movement of many trams has been suspended. "City roads turned into rivers. […] Traffic jams have reached 10 points in some districts," the publication wrote. In the Kherson region, several cities have been left without electricity, reports Herson.Online. On the morning of September 20, the stormy weather incapacitated a large 10 kV substation in the region of the former regional cannery. The supply of electricity to the auxiliary transformer substation stopped, which reusted in a blackout in residential areas, schools and kindergartens Antonivka, Skhidne and Kindiyka. Repairs works are in progress. The city department of civil protection service said that their top priority is restoration of electricity supplies of socially significant facilities and multi-storey residential buildings with electric stoves. Mykolayiv saw extensive blackouts in the September 19 afternoon. A local website said while the city center is coping with with the stormy, some road intersections remain flooded. Forecasters have warned of the impending worsening of weather in the region, and say the rain would not stop before the end of Tuesday.